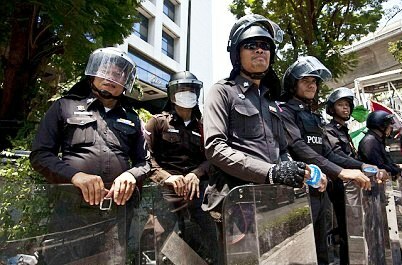 About 200 protesters broke into the facility in search of Thai soldiers. Thousand patients transferred to other facilities. Opposition leaders condemn the act and apologize. AsiaNews sources: a "worrying" situation. The army supports the government, but wants to avoid bloodshed. Bangkok (AsiaNews) - This morning the Chulalongkorn Hospital in Bangkok, located near the garrison of the "red shirts", evacuated some patients and cancelled all surgical operations. The structure remains open only for emergencies. Health authorities ordered the measure after the raid, carried out last night, by anti-government protesters seeking Thai soldiers hidden inside. During the night a group of 200 "red shirts" - close to former Prime Minister Thaksin Shinawatra in exile and supported by the opposition party United Front for Democracy Against Dictatorship (UDD) - raided the hospital. The attackers claimed that the structure was used as a "hiding" place by security forces. Leading the assault was Payap Panket, from the UDD. The surprise action was strongly condemned by the other party leaders, who ensure there will be no such initiatives in future. Weng Tojirakarn released a statement making a "public apology" for the assault on the hospital. He describes the raid as "inappropriate, excessive and unreasonable." "On behalf of all [UDD] leaders - said Weng Tojirakarn - I apologize to the people and Chulalongkorn hospital for the incident. The situation there is out of hand. " This morning, hospital director Adisorn Patradul, confirmed the transfer of some of patients to the Siriraj and other health centres in the capital. He states that the transfer is "voluntary," according to decisions made by patients and relatives. Those who want to, he adds, "may remain to our structure." News sources report that at least 1,000 patients were evacuated. There are about 600, however, who have decided to stay. Speaking on television, the Thai Prime Minister Abhisit Vejjajiva said that government and hospital leaders have evaluated the possibility, later abandoned, to allocate police and soldiers to defend the structure. The doctors do not want misunderstandings about the "bias" of the centre or on a "political support" for one of the two fronts in the struggle. Abhisit added that government authorities will take strict countermeasures to "circumscribe" the movements of all who arrive in or leave the zone occupied by the "red shirts", Ratchaprasong intersection in the centre of the capital. "We can not disclose all of our initiatives publicly - said the premier - but we are determined to resolve the situation.". Meanwhile Foreign Minister Kasit Piromya in an interview with the Indonesian daily The Jakarta Post says there are no doubts about the loyalty of the military, adding that a coup is very unlikely. General Prateep Tanprasert police chief, states that there are orders of the Centre for the solution of emergency situations (CRES) "to disperse the red shirts, but the police are prepared to support operations "should they get the green light to use force. The "yellow shirts," leaders of the protest in December 2008 that allowed the rise to power of the Democrat Party and current Prime Minister Abhisit Vejjajiva, have also intervened in the crisis: a change in country leadership gained by, among other things, massive street protests and blocking the capital’s two main airports. "The red shirts have created a state within a state - said Suriyasai Katasila, leader of the" yellow shirts"- all with complete impunity." He adds that "the authorities must put an end" to the protests. A source for AsiaNews in Bangkok, an expert on Thai politics, says that "the situation of tension is concentrated in the capital area, while outside" there is no clear perception of what is happening. " The state media , he continues, do not give "detailed" information, but the situation "is becoming increasingly worrying." Rumours are circulating that "the objective is to depose the king" to establish a Republic. Thaksin Shinawatra, for his part, seems willing to sue for slander those who say "he is an anti-monarchist" with the intention of amending the Constitution. The crime of lese majeste in Thailand carries a seven year prison term. Today, a sympathizer of the "red shirts" was arrested for posting on slogans on Facebook against the monarchy.